How was everyone’s weekend?? Grayson and I wanted to take the opportunity to get away for a couple of days and enjoy the glorious weather Austin was having so we decided to have a little stay-cation at one of the cutest hotels in North Austin, Lone Star Court. Both of us have been so busy with work that we haven’t really had time to enjoy being newlyweds, so a little vaca was a must! I’ll be doing a full post on our stay but wanted to show off one of my favorite Fall looks that we shot there. If you are in Austin, I highly recommend checking this place out! I can’t tell you how thrilled I am that Fall weather is finally upon us! I think the most exciting part is that I can finally whip out some of my latest cold-weather finds to cozy up in and wear without dying of a heat stroke. Fingers crossed this Austin “cold front” actually decides to hang around. Now, what are some of y’alls favorite Fall trends for 2016? My absolute favorite has to be a good poncho and let me tell you why! 1, They are never going out of style. 2, Ponchos are the coziest article of clothing especially if you score one in cashmere! 3, They literally go with anything and everything. My Fall wardrobe is comprised of more ponchos than I would like to admit and I can’t wait to start wearing them all! 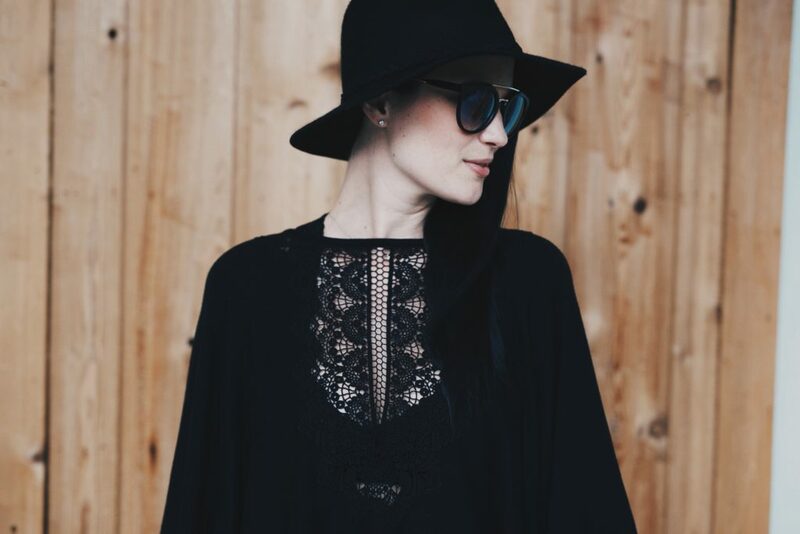 So you can probably imagine my excitement when I scored this black Ella Moss poncho. To me, this piece is such a huge staple in anyone’s Fall attire mainly because it’s so versatile yet has such intricate details on the front. See photos! If you’re not normally a poncho type of gal let me give you a few helpful tips on how to wear one. Ponchos come in all shapes and sizes and if you don’t find the right one for your body type you might as well just not wear one at all! Even though you would think they’re going to fit, make sure you always try it on with something similar to what you would wear it with. I always layer my ponchos and wear a tank or long sleeve basic top underneath so the fabric doesn’t irritate my skin, especially if it’s wool. If that sounds like a familiar issue, I would suggest getting something that is 100% cotton like the poncho in the photos or something that is cashmere. The great thing about pieces like this is that you can easily dress them up or down. I was dying to wear my new Frye OTK boots so I tailored this look to be more on the casual chic, boho side for our dinner date! Is that even a thing… Casual chic, boho?! If you’re ever in doubt with what to wear your poncho with, throw on a pair of black leggings or skinny jeans and you’re all set. Most of you know that if you see me in the Fall, I am ALWAYS in black leggings. I mean, they go with everything so how can I resist! If you wanted to dress this look up a little more, I would suggest throwing on a pair of heels with a cute clutch and you get a totally different vibe. 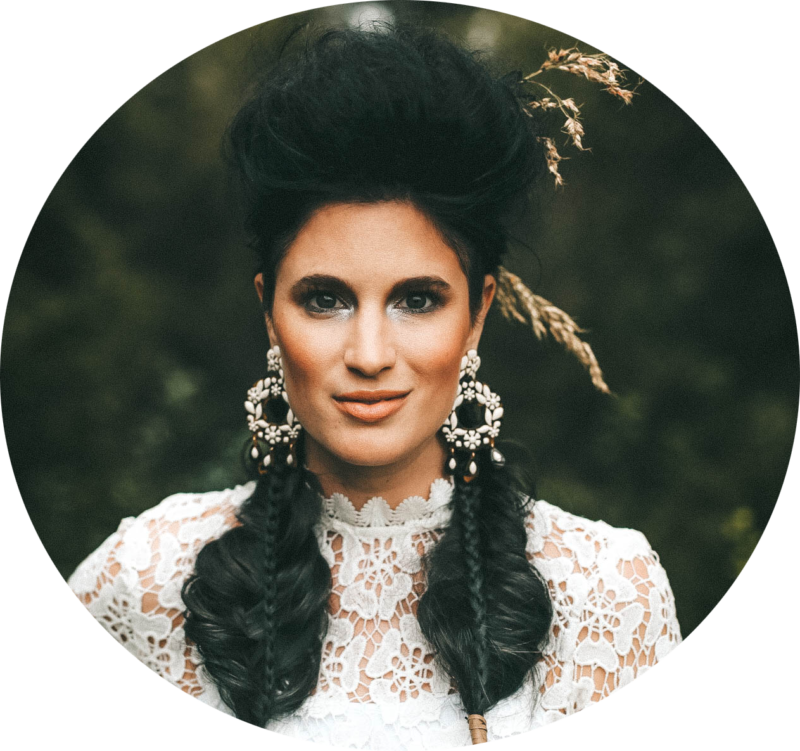 If you’re ever in need of inspiration, head over to Pinterest and you’ll most likely see quite a few similar inspiring looks! Let’s talk bags. 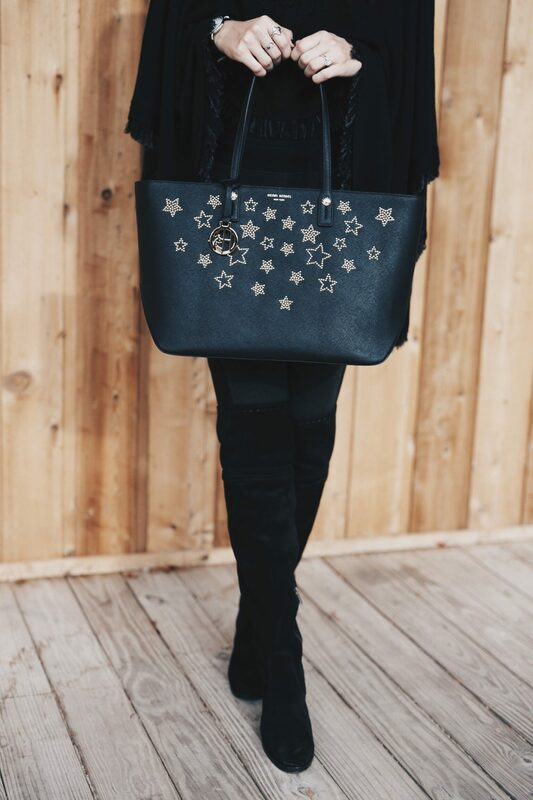 One of my favorite handbag designers must have been reading my mind when they came out with their new Fall line… STARS!! From early on in my childhood I was obsessed with stars and moons. I mean, I even have multiple star tattoos, which I’m sure y’all have noticed. So when I saw Henri Bendel’s star handbags, I was sold and I even got TWO of them!! I decided to throw on the tote for our dinner and evening stroll. 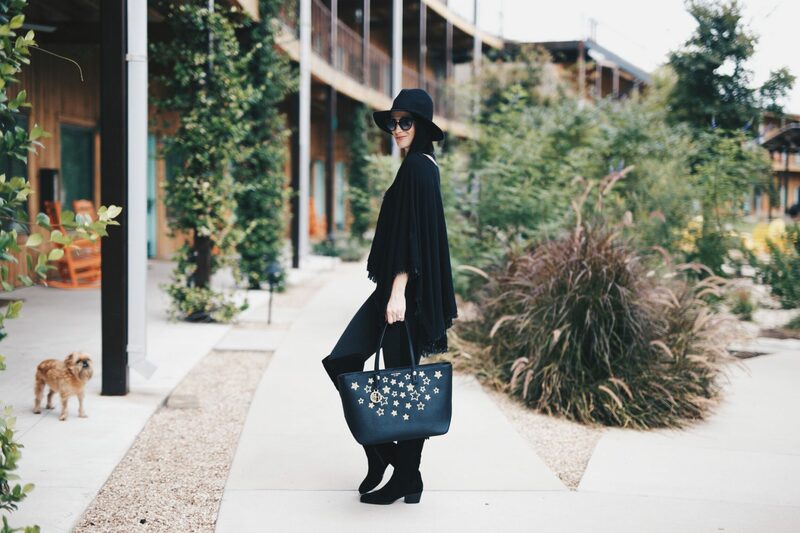 How cute are those gold studded stars?! Since we had Mr. Steven Jalapeño with us I had to lug all of his stuff with me so I needed a larger bag that was still dressy enough to take out with me. And this one definitely did the trick! Ok, so now majorly off topic – Have any of you Austinites been to the new part of the Domain, Rock Rose?? 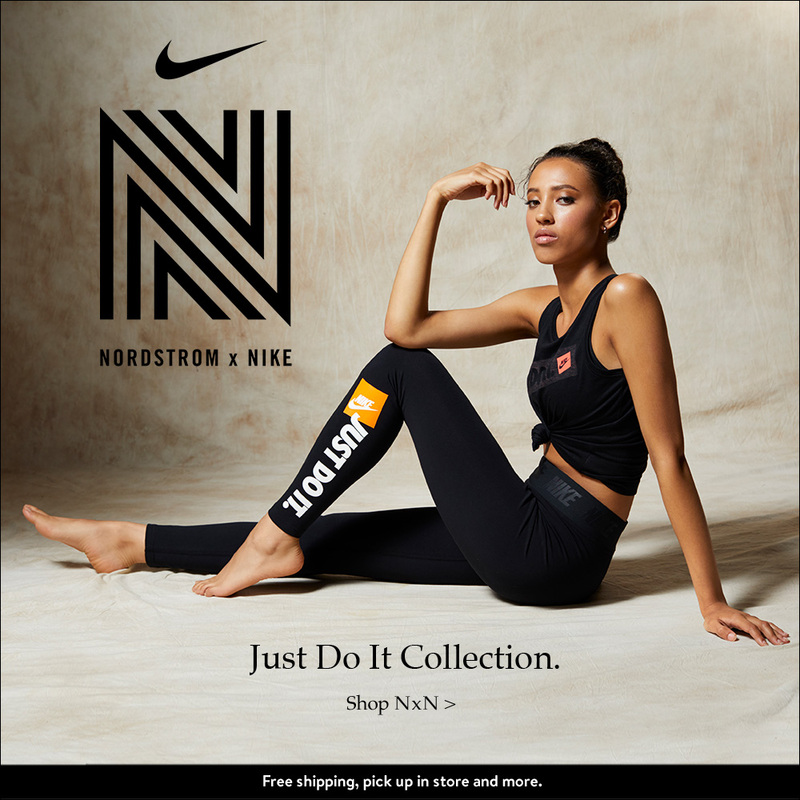 Nordstrom just opened their second Austin location and all I can say is…AMAZING!!! And Frye is actually opening up a store there too!! I’m going to get in a lot of trouble with all of these amazing stores coming to town! It’s is already THE hot spot to be and can’t wait to see how much North Austin grows because of this. Exciting times!! I love everything about this look, Ashley! That bag is so fun! 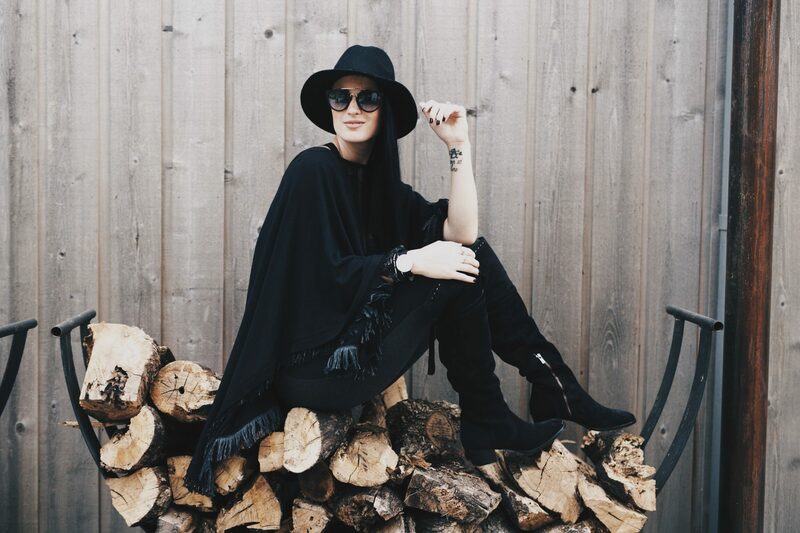 Those boots are SO fab, and you look gorg per usual! You look so chic in all black!! Love this bag! Ashley-you look amazing! I never wear black but you made this outfit look so fun even though it’s all black! yay on getting some newlywed time with your hubby! Ashley, You look so stunning. I adore the all black. this is so chic. You look so ridiculously cool! Love that top and those boots! Omg stunning! 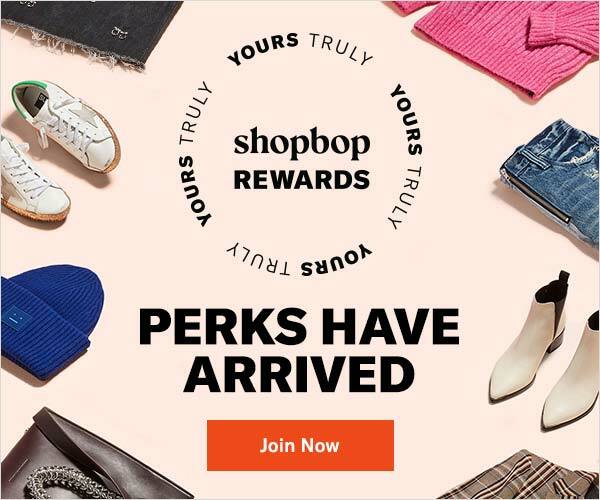 Can you be my personal shopper and dress me? I can’t get over how chic you look! 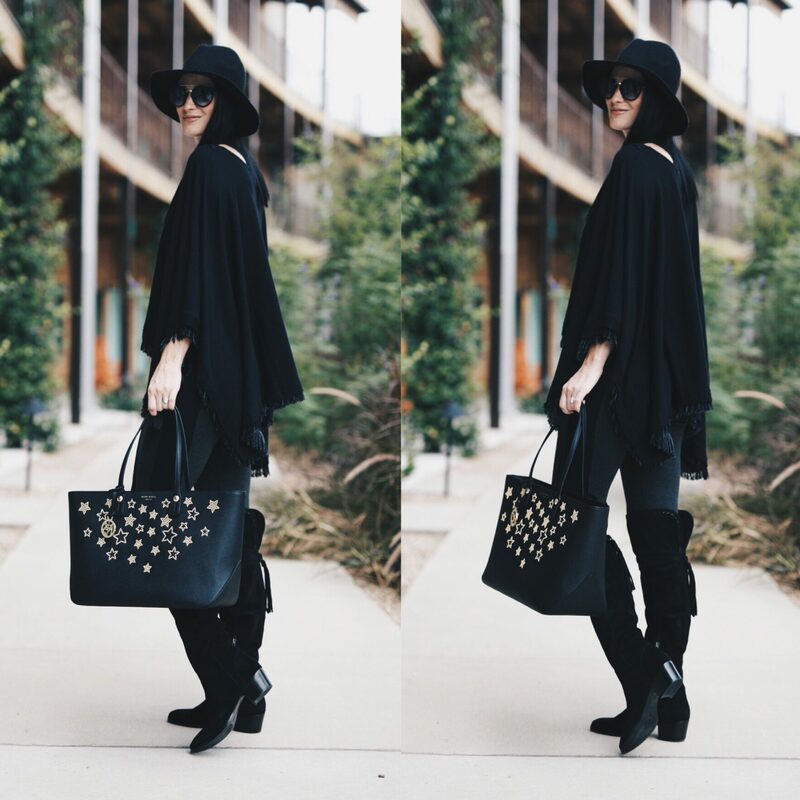 The boots, poncho, hat, and sunnies are perfection! Such a chic look! I love those boots and the poncho! 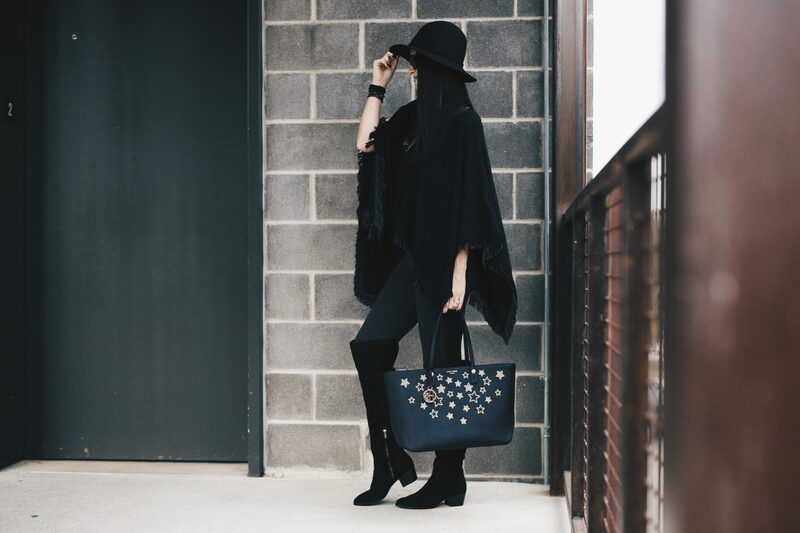 I love all black and that tote is to die for! That bag is to die for. You look so amazing. You pull off all black SO well. This is the perfect fall look! 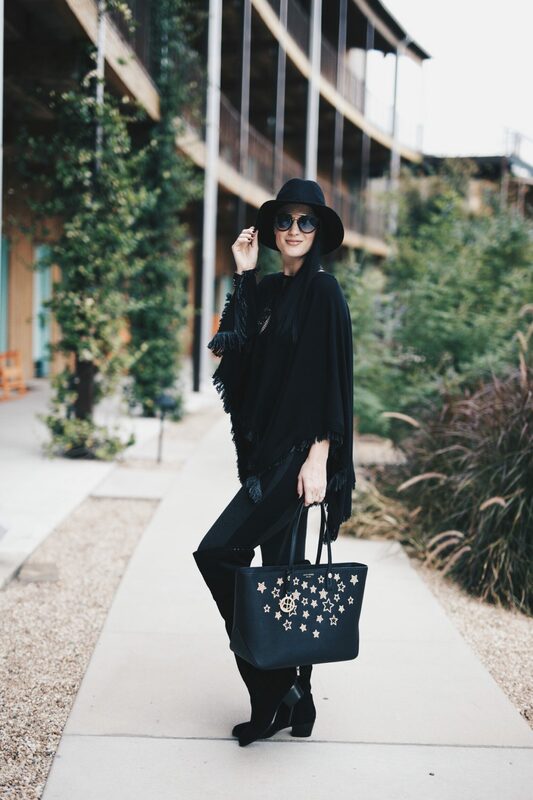 I’m so obsessed with that black poncho and adore how you styled it!! I love, love a good poncho! This black one is a staple for sure! And how cute is that little puppy photo bomber?! AWWW, I’m glad you noticed!! hahaha I was wondering if anyone would! Well Ash you look amazing!! Love this look! 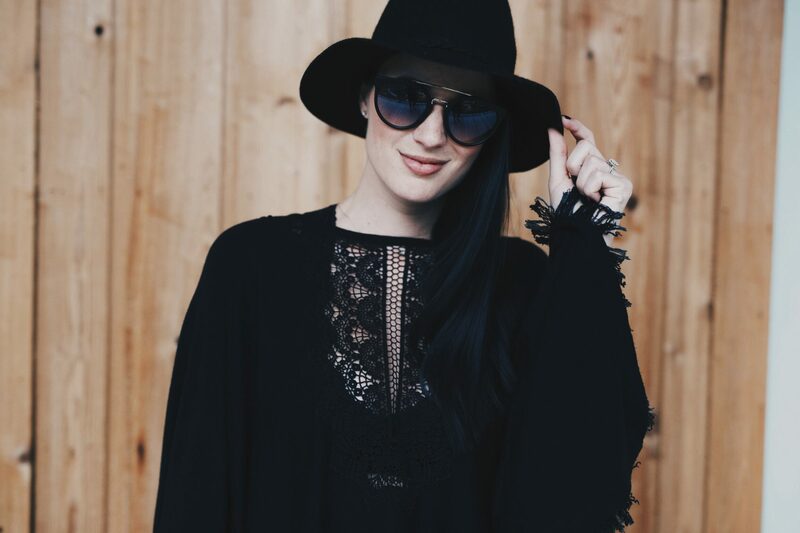 You are definitely my go-to girl when I need inspo on how to rock an all black look! PS: Can’t believe I’ve never visited your blog before! Love your writing!! GIRL. You made my day! No one has ever said they like my writing!!! I’m a terrible writer, so that means a lot!! THANK YOU! This poncho is SO good! Your photos are so beautiful! Your look is perfect for fall. I am obsessed with this look! I know I already told you on instagram, but seeing all the pics & details has me swooning! I haven’t snagged a poncho for the season but you are making me want to! Gorgeous! 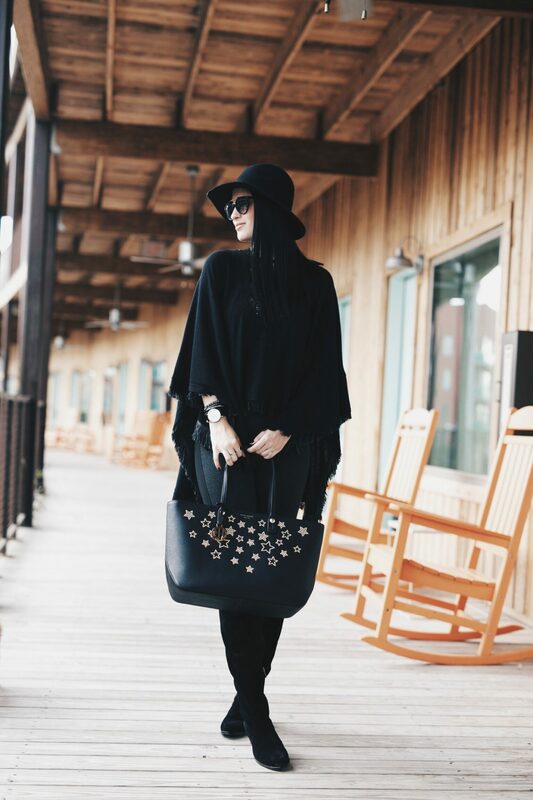 Gorgeous detaling in the poncho and the bag! Wow you look stunning! Making me think I need to go shopping today!! You look SO chic!!! Love this look! Wow, that bag is fabulous! This such a great boho look! 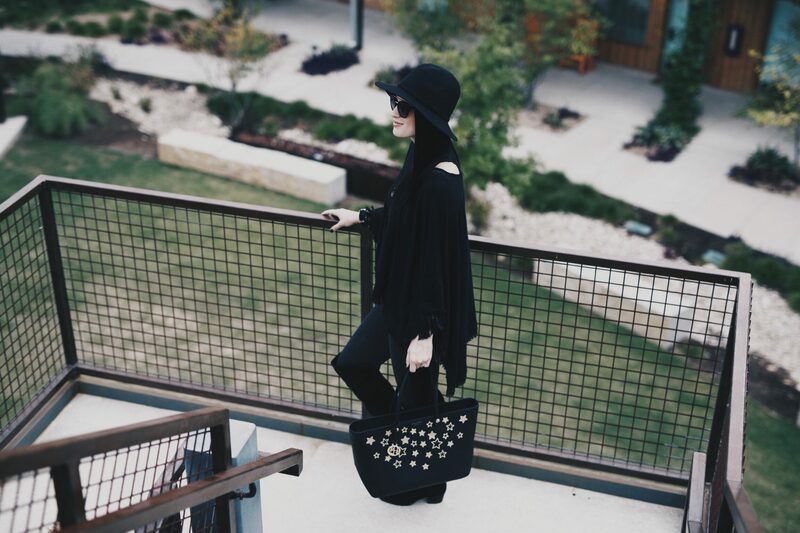 This Fall Poncho is perfect for Fall! I love the all black look too- you’re so chic Ashley!! This is a such a rich ensemble. 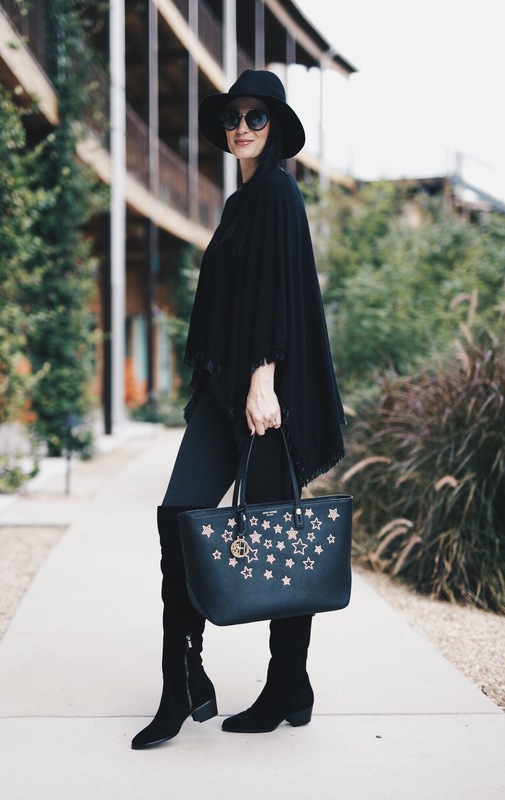 Love how the texture of each pieces stands out especial the stars on your bag. So fabulous! adore this handbag! great accessory to pair with an all black outfit! I think this is one of my favorite looks from you! You look gorgeous! Seriously babe you have the best accessories LOVE!! I’m loving those boots! You’re a vision in all black! I am lovin those boots girl! so cute!! I adore all black outfits and this one is perfect!!! Love everything about it! Those OTK boots are great. I’ve been going back and forth on if I want a pair but I just don’t think they are for me. But you always make them look…you make EVERYTHING look good and make it want it all. Haha.